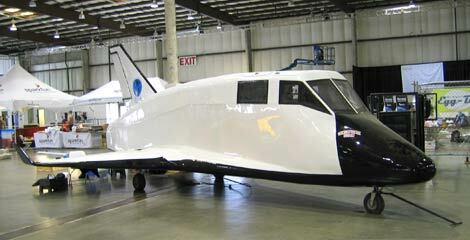 Setup day was the only time we could get a clear shot of the Hermes space shuttle, [Morris Jarvis’] entry in the suborbital tourist space race. Early Saturday morning, the line stretches to infinity and beyond. At the other side of the fairgrounds, scads of locals took advantage of the free bike valet service and scored a $5 admission discount to boot. 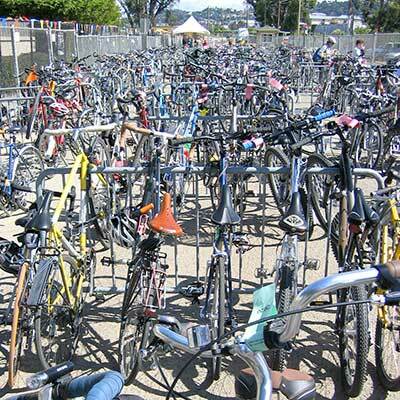 And this view shows only about half of the bikes present! We only spotted one recumbent parked out here, but quite a few inside as maker exhibits. So much walking! 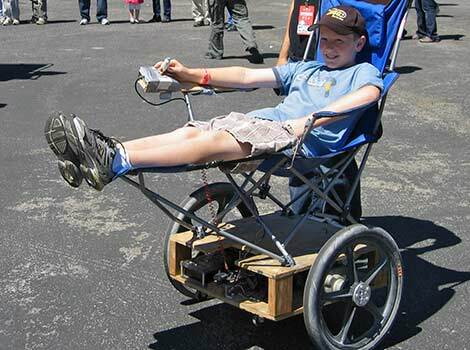 This kid had the right idea, scooting around in luxury. 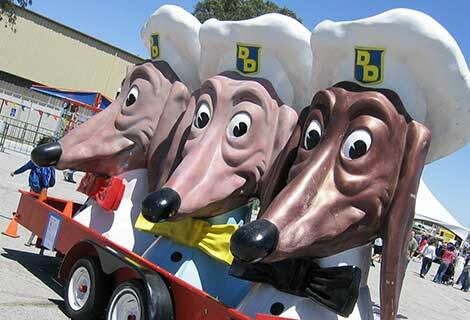 It’s not a Bay Area party until the original Doggie Diner heads show up! 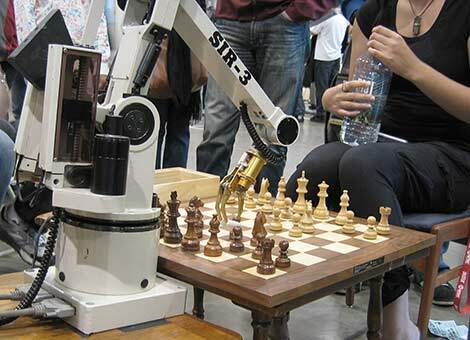 …but there were no Wookiees present to play chess against this robotic arm. A row of Anybots, all ready to take up their overlord duties. Our favorite giraffe joined the rave, replete with his new animatronic head. 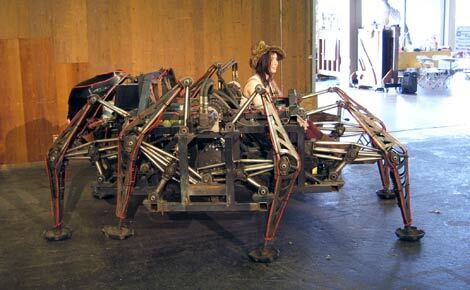 The Mondo Spider, like its smaller biological inspiration, manages to be simultaneously fascinating and potentially deadly. It is, however, anything but silent. …Saphira, the fire-breathing dragon! Rar! 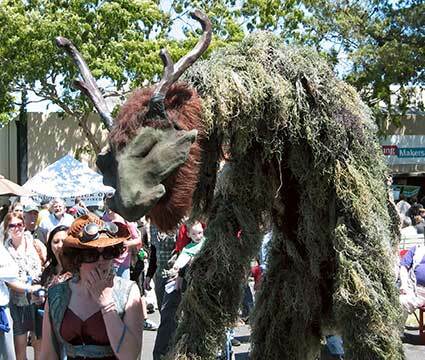 Nearby, [Haley Duke’s] Swamp Kirin puppet loomed over fairgoers. Kirin, we just discovered, appear to be mortal enemies of efficient JPEG compression. 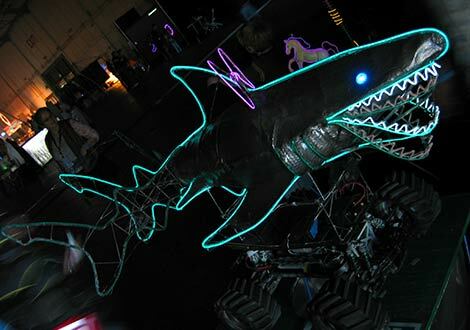 [Todd Williams’] Land Shark is an animated EL wire-framed skeleton atop a large radio controlled car chassis — a great effect in the dark! We seem to be on a bitey creature kick. 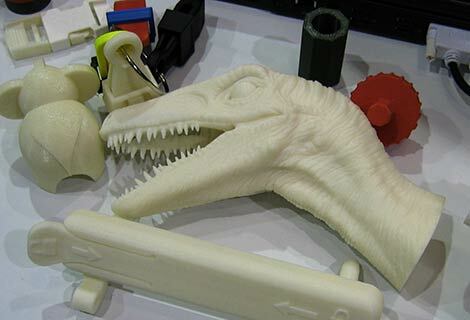 Here, have a Velociraptor head popped out of a commercial ABS extrusion 3D printer. 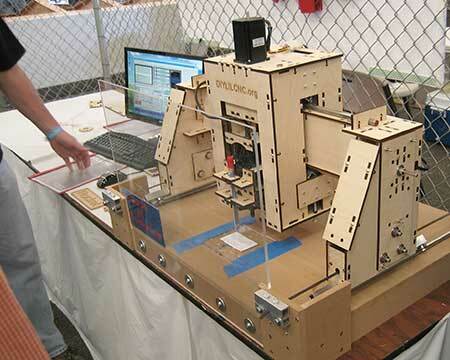 We posted about the DIYLILCNC mill late last year. What struck us when finally seeing it in person is how it’s anything but li’l. 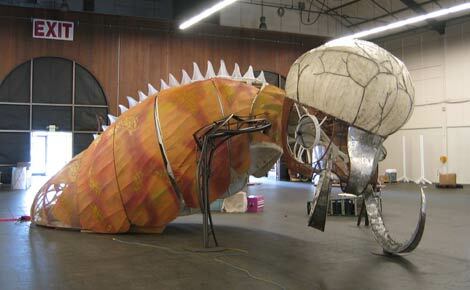 This thing bullies RepRaps and takes their lunch money! They were even making something in the Maker Shed store. What exactly? We’ll give you a hint: it’s printed with green ink on the back. Man, they got us good. Went in needing just one Parallax RFID reader, and somehow couldn’t leave before spending the equivalent GNP of Guam. This is here just for blog cred. 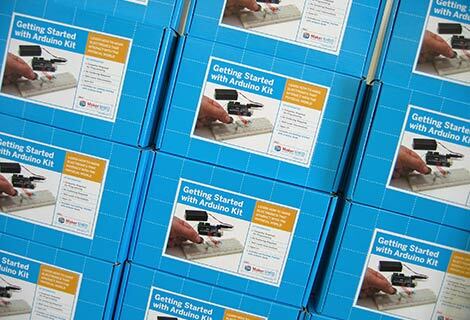 Our hats are off — again — to SparkFun Electronics. These guys could’ve easily brought enough merchandise to bankroll their retirement from this one show. Instead, they taught kids how to solder. How cool is that? 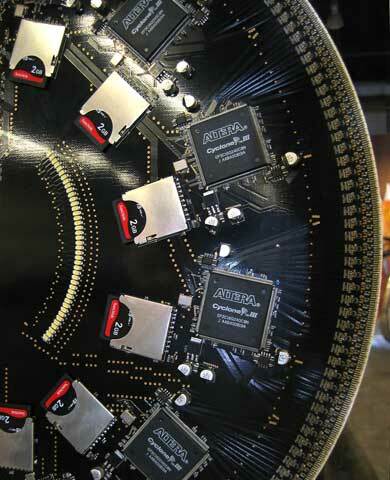 FPGA pr0n from Art Magnitude’s ORB v.2, a persistence-of-vision globe on a grand scale. 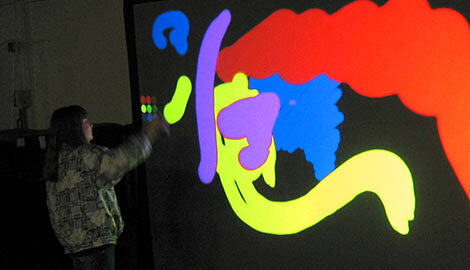 There was always a line waiting to play with Tangile interaction’s digital graffiti wall. If we’ve overlooked or glossed over your favorite subject or display, it may be that we’re expecting to cover it in more detail in the future. Keep your eyes peeled for more wild stuff here! Good photos – it’s especially nice to see the egress in the light. But it was really crowded this year! I hope they move to a larger venue for next year because it was too packed to stop and check out all the awesome displays. Very crowded indeed. The main exhibition halls were especially bad; the pathways between booths were too narrow and I’m no Comic Book Guy. But it was fun! I want to see the POV globe in action! Had the chance to see the POV globe display a scene from “Up” during a spare moment while running a booth, very cool! Wow Phil, killer post. Once again I find myself wishing I lived on the west coast… I’m sorry I missed the spectacle. That FPGA-led blinker looks like a total overkill. Can’t be a very efficient design, really. 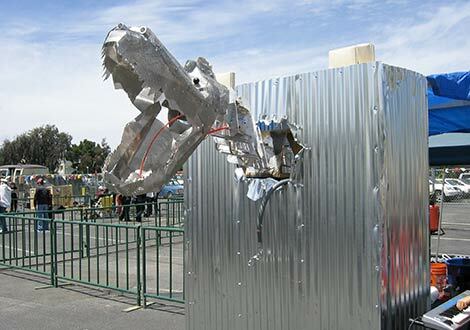 Just got back from Bay Area Maker Faire 2010, and it was truly amazing. Not only for the personal and corporate technological feats, but the kindness of complete strangers so willing to share everything about their work. I walked around the faire with my daughter in her very own lab coat, and was greeted by smiling faces eager to describe everything in detail, open to share. She handed out cards for her very own “Super Awesome Maker Show” on youtube, dedicated to makers and hackers and everyone else in the spirit of creating. 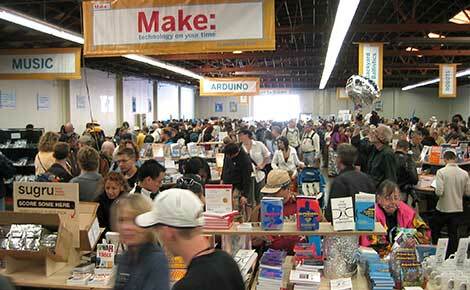 Now it seems the Maker Faire crowd has responded! I think she even made it to BoingBoing. Crazy. 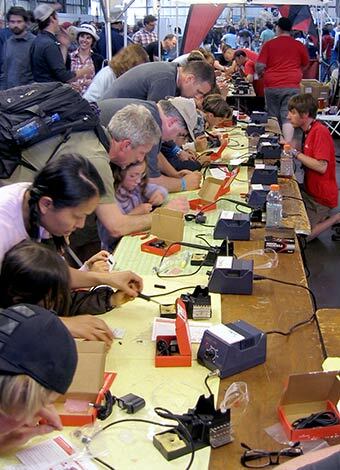 When it comes down to it, hacking and making is about the community. Your arduino blinking light may do so little (except for some blog cred), but it gets you, the student, one step closer to the uber-coders, prototypers and real makers. We all have to start somewhere, and it’s the community that holds it all together. I worked the event-greening again this year, and it was hard to stay working, we all just wanted to go play. 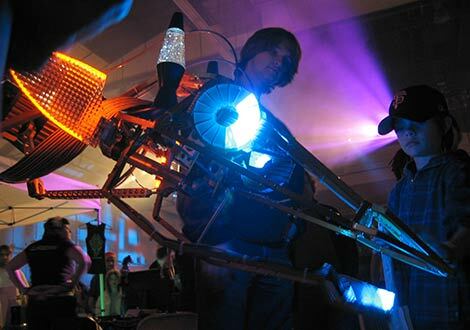 I am inspired anew, and making things out of your trash,(again)…I am swimming in LEDs and slightly dinged kits, and a good friend is scheming up puppets from the crafty leftovers. As the attendees actually rtfm on the event-greening stations, we diverted 5-7 more 4yd dumpsters of compost-ables than last year. The nerds win on the festival waste reduction tally this year. Now we just need mf to pay for me to strip their electronic trash after the party and create dumpster-voltron. I sure hope MF comes back to Austin soon. These pics make me remember just how cool it was. 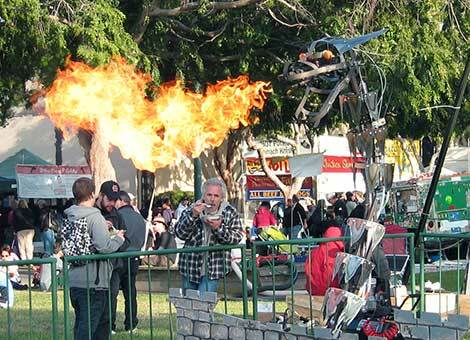 Thanks for the pictures of what looks like a really cool fair! 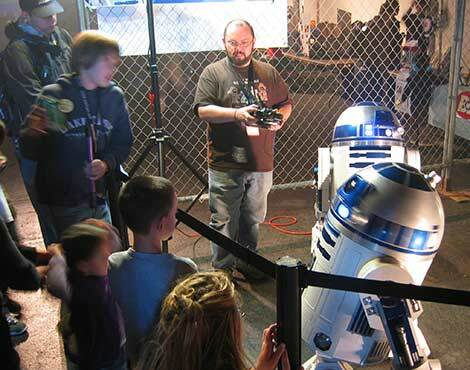 I hope to have something like the Bay Area Maker Faire in Orlando soon. 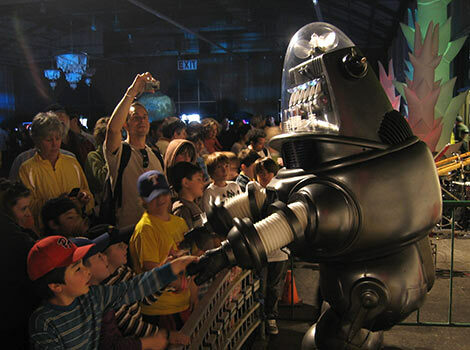 Some of those robots remind me of the arm in the BP Cam live feed. I wonder if some robotic arms that really focused on applying great pressure to plug holes would be a good application for the future?